A discipline-specific community for researchers in the communications and networking research fields. 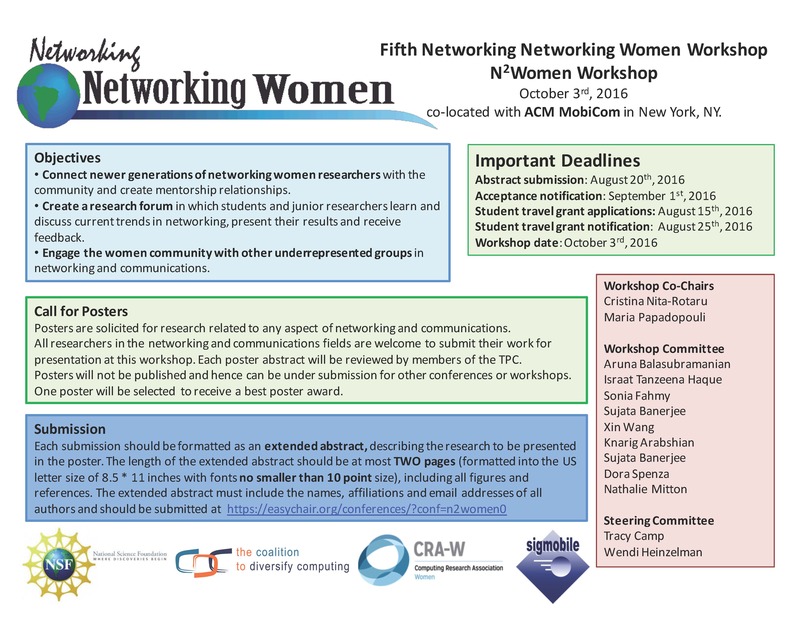 The main goal of N2 Women is to foster connections among the under-represented women in computer networking and related research fields. N2 Women allows women to connect with other women who share the same research interests, who attend the same conferences, who face the same career hurdles, and who experience the same obstacles. Create a research forum in which students and junior researchers learn and discuss current trends in networking, present their results and receive feedback. Engage the women community with other underrepresented groups in networking and communications. The program and the research poster presentation will focus on all areas of networking and communication, including design and experimental work for the physical layer, protocols for the Internet, mobile and cellular networks, and datacenters, with a particular focus on (1) software defined networking, (2) Internet-of-things, and (3) network applications. The workshop is primarily targeted at graduate students. However, undergraduate students are not excluded, but they will have to have done some research and submit a poster. The activities of the workshop are planned around what you do once you get into grad school.